Venezuela is located in South America. The country is located to the east of Colombia, south of the Caribbean, west of the Atlantic Ocean and Guyana, and north of Brazil. Discovered by Columbus, the sight of the marsh huts built by the native people would result in the country being referred to as "little Venice", for Venice, Italy. Venezuela is divided into 23 states, a capital district and 72 federal dependencies. The capital city of Venezuela is Caracas. The country rose to prominence after 1999, when the leftist dictator Hugo Chavez assumed power and started imposing what he calls "socialism of the 21st century", aligning himself with terrorist regimes like Iran, and using his petrodollars to influence other countries in the region. After Chavez's death in 2012, his successor Nicolas Maduro continued those policies also when the mostly liberal opposition alliance MUD, a coalition of liberal, Christian democratic and centrist parties, got a majority in the Venezuelan parliamentary elections on December 6, 2015. Once the wealthiest South American country, socialist policies created instability and mass starvation by 2019. The national flag was created by the Venezuelan hero Francisco de Miranda in 1806. It has three stripes with these colors: red, blue and red. Through the years the flag suffered variations in relation to the position and number of the stars. Actually, there are eight stars on the flag and they are located in its center. The white stars symbolize eight former Venezuelan provinces (Caracas, Valencia, Barinas, Cumaná, Barcelona, Margarita, Mérida and Guayana) which became independent of Spain. Gloria al bravo pueblo ("glory to the brave people") is the national anthem. It was an old patriotic song from the independence years written by Vicente Salias. Its music was composed by Juan José Landaeta. On May 25, 1881 Gloria al bravo pueblo was decreed as the anthem of Venezuela by the president Antonio Guzmán Blanco. El Turpial (Icterus icterus) is the national bird, the Araguaney (Tabebuia chrysanta) the national tree and the Orquídea (Cattleya mossiae) the national flower. Area: 912,050 km2. (352,143 sq. mi. ); slightly more than twice the size of California. Cities: Capital—Caracas (metro. area pop. 3.2 million). Other major cities—Maracaibo, Valencia, Barquisimeto, Maracay, Mérida, Ciudad Bolivar. Population (December 2009 est. ): 28,385,627. The majority of Venezuelan people are Christians. The Catholic Church has the greater portion of followers. Other Christian churches in Venezuela are Lutherans, Anglicans, Pentecostals, Seventh Day Adventists, Mormons and Jehovah's Witnesses. Some Muslims and Jews live in Venezuela. A synagogue and a mosque are situated in Caracas. Ethnic groups according to distribution by linguistic stocks. Spanish and American Indian tongues are the official languages of Venezuela, according to the Venezuelan Constitution. Spanish is the most spoken language in Venezuela. Indian languages are spoken by American Indian tribes. A fact of foremost importance in the new Constitution of 1999 is that of recognizing the existence of the indigenous peoples with all their rights to their ecologies, their culture, cosmology, their land, their traditional knowledge, medicine, and their languages. The president is elected by a plurality vote with direct and universal suffrage. The term of office is six years, and a president may be re-elected to a single consecutive term. The president appoints the vice president. He decides the size and composition of the cabinet and makes appointments to it with the involvement of the National Assembly. Legislation can be initiated by the executive branch, the legislative branch (either a committee of the National Assembly or three members of the latter), the judicial branch, the citizen branch (ombudsman, public prosecutor, and controller general) or a public petition signed by no fewer than 0.1% of registered voters. The president can ask the National Assembly to reconsider portions of laws he finds objectionable, but a simple majority of the Assembly can override these objections. The National Assembly is unicameral, consisting solely of the Chamber of Deputies. Deputies serve five-year terms, and may be re-elected for a maximum of two additional terms. These legislative agents are elected by a combination of party list and single member constituencies. When the Congress is not in session, a delegated committee acts on matters relating to the executive and in oversight functions. In December 2005 pro-government parties took all 167 seats in the National Assembly after opposition parties boycotted the election over concerns with electoral conditions. The Constitution designates three additional branches of the federal government—the judicial, citizen, and electoral branches. The judicial branch is headed by the Supreme Tribunal of Justice (TSJ), which may meet either in specialized chambers (of which there are six) or in plenary session. The justices are appointed by the National Assembly and serve 12-year terms. Under the 1999 Constitution, the Supreme Tribunal of Justice is composed of 20 justices. The 1999 Constitution was amended in 2004, and the total number of justices was expanded by 12 to a total of 32. In December 2004, the National Assembly selected new judges to fill the expansion. The judicial branch also consists of lower courts, including district courts, municipal courts, and courts of first instance. The citizens branch consists of three components—the attorney general ("fiscal general"), the "defender of the people" or ombudsman, and the comptroller general. The holders of these offices, in addition to fulfilling their specific functions, also act collectively as the "Republican Moral Council" to challenge before the Supreme Tribunal of Justice actions they believe are illegal, particularly those which violate the Constitution. The holders of the "citizen power" offices are selected for terms of seven years by the National Assembly. The "Electoral Power," otherwise known as the National Electoral Council (Consejo Nacional Electoral or CNE), is responsible for organizing elections at all levels. Its five members are also elected to seven-year terms by the National Assembly. In the event of a hung vote in the National Assembly, the Supreme Tribunal of Justice can be called on to appoint the members. Chavez's and Maduro's government has been/is supported by political parties such as: Movimiento Quinta República/Fith Republic Movement (MVR), Patria para Todos/Homeland for All (PPT), PODEMOS, Partido Comunista de Venezuela/Communist Party of Venezuela (PCV) and other minor parties. In 2006 President Chávez has announced the building of the Partido Socialista Unido de Venezuela/United Socialist Party of Venezuela (PSUV), a new political group which will merge all pro-Chávez parties into a big one. The first members of the PSUV have been enrolled in 2007. Un Nuevo Tiempo/A New Era (UNT), Primero Justicia/Justice First (PJ), Acción Democratica/Democratic Action (AD), COPEI, Movimiento al Socialismo/Movement for Socialism (MAS) are some of the political parties of opposition. Protest outside the office of the Organization of American States. Venezuela is member of the UN, the OAS and the OPEC. Recently the country has applied to the “Mercado Común del Sur/Southern Common Market” (MERCOSUR) for the admission to the group. MERCOSUR is a South American organisation which promotes free trade among Argentina, Brazil, Uruguay and Paraguay in a similar way to the EU and the North American Free Trade Agreement (NAFTA). Venezuela had belonged to the Andean Community of Nations since 1973. In 2006 the Venezuelan government withdrew the country from the bloc when two of its members (Colombia and Peru) signed free trade agreements with the United States. Additionally President Chávez has proposed the creation of the Bolivarian Alternative for the Americas (ALBA), another international organization which would promote the cooperation between the Latin American and Caribbean republics. This bloc pretends to be the opposite to the Free Trade Area of the Americas (FTAA), the organization proposed by the United States. At the moment Venezuela, Cuba, Nicaragua and Bolivia are trying to apply the principles of the ALBA among themselves through an agreement called "Tratado de Comercio de los Pueblos/Peoples’ Trade Agreement" (TCP). Ecuador is considering joining the group. President Chávez has promoted his "Bolivarian Revolution" as a model for other countries to follow. The policy calls for the establishment of a "multi-polar" world devoid of U.S. influence and for greater integration among developing countries. Venezuela is currently advocating regional integration through its PetroCaribe and PetroSur petroleum initiatives, the creation of a South American Community of Nations, and the establishment of the Bolivarian Alternative for the Americas (a social integration project proposed by President Chavez as an alternative to the Free Trade Area of the Americas). In April 2006, President Chávez announced he was withdrawing Venezuela from the Andean Community trade bloc. In July 2006, Venezuela officially joined the Southern Common Market, MERCOSUR. Before it can become a full member of MERCOSUR, Venezuela must conform to the trade bloc's economic regulations. Congressional approval by Brazil and Paraguay is also still outstanding. The Venezuelan Government maintains very close relations with Cuba and advocates an end to Cuba's isolation. Since 2005, President Chávez has deepened relations with Iran, a state sponsor of terrorism, by signing multiple economic and social accords and publicly supporting Iran's controversial nuclear program. President Chávez has also reached out to the anti-American and anti-West regimes of North Korea, Belarus and Syria. The Venezuelans have also embarked on a worldwide effort to increase their presence in embassies overseas in Africa and Asia. President Chávez has also launched a major renovation of the Venezuelan Armed Forces by purchasing new advanced weaponry. In 2005-06, Venezuela purchased 100,000 AK-103 rifles from Russia and signed an agreement to construct a rifle and ammunition complex . Venezuela has also purchased dozens of Russian attack and transport helicopters, and has begun receiving 24 Russian Sukhoi Su-30MK 2-seat fighters. 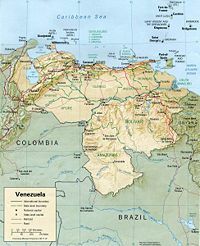 Venezuela has longstanding border disputes with Colombia-aggravated most recently by the capture of a Colombian insurgent leader inside Venezuela—and Guyana, but seeks in general to resolve them peacefully. Bilateral commissions have been established by Venezuela and Colombia to address a range of pending issues, including resolution of the maritime boundary in the Gulf of Venezuela. Relations with Guyana are complicated by Venezuela's claim to roughly three-quarters of Guyana's territory. Since 1987, the two countries have held exchanges on the boundary under the "good offices" of the United Nations. Hugo Chávez on USS Yorktown, 2002. U.S.-Venezuelan relations have been tense in recent years. President Hugo Chávez has continuously defined himself in opposition to the United States, using inflammatory rhetoric to insult President Bush and senior administration officials. For example, in his September 2006 speech to the UN General Assembly, President Chávez called President Bush "the Devil" and other offensive names. The United States continues to seek constructive engagement with the Venezuelan Government, focusing on areas of technical cooperation. Major U.S. interests in Venezuela include promotion of U.S. exports and protection of U.S. investment, preservation of Venezuela's constitutional democracy, closer counter-narcotics cooperation, more vigorous efforts on counterterrorism, and continued access to petroleum. U.S.-Venezuelan commercial ties are deep. The United States is Venezuela's most important trading partner, representing about a third of imports and approximately 60 percent of Venezuelan exports. In turn, Venezuela is the United States' third-largest export market in Latin America, purchasing U.S. machinery, transportation equipment, agricultural commodities, and auto parts. Venezuela's opening of its petroleum sector to foreign investment in 1996 created extensive trade and investment opportunities for U.S. companies. As a result, Venezuela is one of the top four suppliers of foreign oil to the United States. The Department of State is committed to promoting the interests of U.S. companies in overseas markets. For contact information and a list of government publications, please go to the end of this document. Venezuela is a minor source country for opium poppy and coca but a major transit country for cocaine and heroin. Money laundering and judicial corruption are major concerns. In 2004 and early 2005, counternarcotics cooperation between the U.S. and Venezuela deteriorated significantly. In March 2005, the Venezuelan National Guard removed its highly experienced members from the U.S.-supported Prosecutor's Drug Task Force. In August 2005, the Government of Venezuela accused the U.S. Drug Enforcement Administration (DEA) of espionage and terminated cooperation with the DEA pending negotiation of a new cooperation agreement, which has gone unsigned as of October 2006. President Bush decertified Venezuela on counternarcotics cooperation in 2005, 2006, and 2007. In June 2006, Venezuela was listed at Tier 3 status in the State Department's Report on Trafficking in Persons. Tier 3 status indicates a perceived lack of effort to combat human trafficking. In May 2006, the Secretary of State certified that Venezuela was not fully cooperating with U.S. counter-terrorism efforts. As of October 1, 2006, the United States Government has prohibited arms sales and services to Venezuela. Venezuelans under Chavez have suffered a loss of basic human rights. Chavez has shown a marked intolerance for fundamental human rights  and is accused of funding insurgent activity outside of Venezuela's borders. Chavez has much control of oil revenues from Venezuela's state owned, state run oil monopoly. While Chavez in public criticizes capitalism, he has sought to manipulate oil prices above $60 per barrel for Venezuela's largest customer, the United States. Real GDP increased by 10.3% in 2006. The economy recovered strongly in 2004 (17.9%) and 2005 (9.3%) after two consecutive years of deep economic recession (in 2003, Venezuelan GDP contracted 7.7%, after contracting 8.9% in 2002). The economic recovery has been driven by a large increase in government expenditures, based on an oil windfall, which in turn generated higher consumption levels. The Consumer Price Index increase was approximately 17% at the end of 2006, following increases of 14.4% in 2006 and 19.2% in 2004. As of January 23, 2003, all foreign exchange requests must be approved by the National Exchange Control Administration (CADIVI) and the Central Bank (BCV) completes all legal purchase and sale of foreign currency. The current exchange control regime rates for U.S. dollar exchange rate are: Bs. 2,144.60=U.S. $1.00 for purchase operations, and Bs. 2,150=U.S. $1.00 for sale operations. The national budget for 2007 assumes that the government will not devalue this year. Nonetheless, some local economists expect devaluation in late 2007 due to the increasing disparity between official and parallel market rates. Central Bank-held international reserves increased to over U.S. $36 billion at the end of 2006. The reserves would have been higher, but the BCV transferred $6 billion to the National Development Fund (FONDEN) during the last quarter 2005, as directed by the Central Bank Law (July 2005) and an additional $4.3 billion in 2006. The level of international reserves is expected to decrease during 2007 after additional transfers of foreign reserves to FONDEN and because the Central Bank Law established that state-owned oil company PDVSA will only transfer the foreign exchange earnings needed for its domestic expenses, taxes, royalties, and dividends to the BCV, and would transfer the rest to FONDEN. Venezuelan sovereign debt, both domestic and foreign, has decreased in recent years in both absolute terms and as a percentage of GDP. Venezuela's external debt/GDP ratio of approximately 16% is low by Latin American standards. Venezuela's Emerging Markets Bond Index investment risk rating, at 202 basis points, dropped somewhat over 2005, but remained higher than many in the region. There is considerable income inequality. The Gini coefficient was 0.45 during 2006. According to government statistics, the percentages of poor and extremely poor among Venezuelan population were 33.9% and 23.2%, respectively, in 2006. These high ratios are due primarily to lower real wages earned by employees, and high rates of un- and underemployment. On the other hand, the government of Hugo Chavez increased social spending and subsidised food and education. Under Chavez, the poverty rate also decreased from 55.1 percent in 2003 to 30.4 percent in 2006. Starting January 1, 2008 Venezuela will adopt the "Bolívar Fuerte" as its new currency. The new Bolívar eliminates the three zeros of the older currency. For example, 50,000 Bolívars are equal to 50 Bolívar Fuertes. Although economic growth has been impressive, as a result of the oil windfall, many in the Venezuelan business community remain very concerned about President Chavez' vision for 21st Century Socialism and what it portends for the private sector. Economic prospects remain highly dependent on oil prices and the export of petroleum. In 2005, the oil sector accounted for roughly 15% of GDP, 90% of export earnings, and about half of the central government's ordinary revenues. Venezuela remains the fourth-leading supplier of imported crude and refined petroleum products to the United States. The Venezuelan government has sought more income from the petroleum sector. The first example was a unilateral decision in late 2004 to increase the royalty rate on production from the Orinoco heavy crude "strategic associations" with international oil companies from 1% to 16.67%. In the 1990s, the Government of Venezuela opened up much of the hydrocarbon sector to foreign investment, promoting multibillion-dollar investment in heavy oil production, reactivation of old fields, and investment in several petrochemical joint ventures. By the late 1990s, almost 60 foreign companies representing 14 different countries participated in one or more aspects of Venezuela's oil sector. On November 13, 2001, under an enabling law authorized by the National Assembly, President Chavez enacted a new Hydrocarbons Law, which came into effect in January 2002. This law replaced the Hydrocarbons Law of 1943 and the Nationalization Law of 1975. Among other things, the new law provided that all oil production and distribution activities would be the domain of the Venezuelan state, with the exception of the joint ventures targeting extra-heavy crude oil production. Under the new law, private investors cannot own 50% or more of the capital stock in joint ventures involved in upstream activities. The new law also provided that private investors could own up to 100% of the capital stock in downstream ventures. A Gaseous Hydrocarbons law promulgated earlier by the Chávez government also allowed substantial participation by private investors with respect to gas production ventures. During the December 2002-February 2003 general strike, petroleum production and refining by PDVSA, the state-owned oil company, almost ceased. Despite the strike, these activities eventually were substantially restarted. Out of a total workforce of 45,000, over 20,000 PDVSA management and workers were subsequently dismissed because the government asserted they had abandoned their jobs during the strike. Current levels of production remain a subject of debate, with considerable difference between the levels cited by the Venezuelan government and those cited by private sector and international observers. In early 2005, the government informed companies with operating service contracts for mature fields that they must migrate the contracts to joint ventures that conform to the 2001 Hydrocarbons Law. The government threatened to seize fields operating under the services contracts on December 31, 2005 if oil companies did not sign transition agreements to migrate their contracts. All but three companies ultimately signed joint venture agreements with the government. One company was bought out by its partner while the fields operated by two other companies were ultimately taken over by the government. One of these disputes was handled by negotiation while another company decided to take its case to international arbitration. In early 2007, President Chávez announced that the Venezuelan government would take a majority government share in the remaining foreign investments in the oil sector, including the four heavy-oil "strategic associations." Several international oil companies agreed to migrate their interests to joint ventures with majority government ownership. Two U.S. companies decided to pull out of Venezuela — one is still in negotiations over compensation while the other has announced that it will seek international arbitration. Thanks to petroleum exports, Venezuela usually posts a trade surplus. The United States is Venezuela's leading trade partner. In 2006, the United States exported over $9 billion in goods to Venezuela, making it the 22nd largest market for the U.S. Including petroleum products, Venezuela exported about $36 billion in goods to the U.S., over the same period, making it our 9th largest source of goods. The government of Venezuela has taken a vocal role against the proposed Free Trade Agreement of the Americas (FTAA). Its stated goal is to expand its Bolivarian Alternative for the Americas (ALBA) project and develop a South American bloc (See Foreign Relations). Manufacturing contributed an estimated 17% of GDP in 2006. The manufacturing sector continued its recovery started in 2004, but remained hindered by a marked lack of private investment. Venezuela manufactures and exports steel, aluminum, textiles, apparel, beverages, and foodstuffs. It produces cement, tires, paper, fertilizer, and assembles cars both for domestic and export markets. Agriculture accounts for approximately 3% of GDP, 10% of the labor force, and at least one-fourth of Venezuela's land area. Venezuela exports rice, cigarettes, fish, tropical fruits, coffee, cocoa, and manufactured products. The country is not self-sufficient in most areas of agriculture. Venezuela imports about two-thirds of its food needs. Through November 2006, U.S. firms exported $412 million worth of agricultural products, including wheat, corn, soybeans, soybean meal, cotton, animal fats, vegetable oils, and other items to make Venezuela one of the top two U.S. markets in South America. The United States supplies roughly one-quarter of Venezuela's food imports. Official unemployment statistics registered 8.9% unemployment in December 2006. Unofficial estimates are significantly higher. The public sector employs about 13% of the work force, while less than 1% work in the capital-intensive oil industry. About 18% of the labor force is unionized, and unions are particularly strong in the petroleum and public sectors. The "informal" sector accounts for some 45% of the work force, or 5.5 million people. Rebellion of Caracas, April 19. Battle of Carabobo, June 24. Declaration of Independence, July 5. Simón Bolívar's Birthday, July 24. Discovery of the American continent (similar to the Columbus’ Day), October 12. Simón Bolívar's Death, December 17. Carnivals, between February and March. Holy Week (Easter), between March and April. Worker's Day (similar to the American Labor Day), May 1. Baseball is considered the most popular sport in Venezuela. There are many Venezuelan baseball players who play in the American Big Leagues. Basketball is another sport which has many supporters. Recently football soccer has attracted great attention from the Venezuelan media because of the good performance of the Venezuelan football Team in international matches. In 2007 the Cup America, the oldest football soccer competition of South America, is held in Venezuela. Other sports like rugby and American football are mainly practiced at universities. In some Venezuelan towns bullfighting and cockfighting are practiced. Venezuela has many newspapers, radio stations and TV channels, but the most important ones are located in Caracas. Some newspapers of Caracas are: El Universal (founded in 1909, conservative); El Nacional (founded in 1945, leftist, but not pro-government); Últimas Noticias (founded in 1943, leftist and pro-government); The Daily Journal (founded in 1945, an English language newspaper); El Mundo (founded in 1958); 2001 (founded in 1973); Meridiano (founded in 1969, a sports newspaper); El Nuevo País (founded in 1988) and Tal Cual. RCTV, Venevisión, Televén and Globovisión and Meridiano TV are private TV channels from Caracas. Venezolana de Televisión, VIVE, and TVes are state-run TV stations. Since 2007 under the Chavez regime, the state-run TVes has operated in place of the privately owned RCTV in Venezuela since Chavez forced RCTV off the air and seized its broadcasting infrastructure for TVes by claiming that RCTV was a threat to his regime by supporting the 2002 coup attempt against him. The forced over-the-air closure of RCTV in favor of TVes drew heavy domestic and international criticism against the Chavez regime on the grounds of suppression of freedom of speech and freedom of the press, as well as an attempt by the regime to silence its critics. Telesur is an international TV channel funded by the governments of Venezuela, Cuba, Brazil and Argentina. Its headquarters is located in Caracas. Its missions are to offer a new vision of Latin America (according to the viewpoint of those governments) to the rest of the world and to counteract the influence of US media in the American continent. In 2004 the Venezuelan National Assembly passed the Law of Social Responsibility in Radio and Television. This law establishes ambiguous guidelines regulating broadcasting content. It further requires the stations to transmit the government's educational, informative, or public safety broadcasts for up to 60 minutes a week. Finally, the law requires stations to transmit in full Chavez's speeches and other political messages, some of which last up to five hours. In today's Venezuela, independent journalists are sometimes arrested and frequently fined and harassed in an effort to intimidate those who speak against the Chavez regime. The Chavez regime has bullied the remaining independent media into self-censorship, and does not want the press to reveal the inefficiencies of his government. He has gone to great lengths to bar journalists of privately owned, independent media from covering government hearings, and he now requires stations to use government producers for documentaries and programs. At the time of Spanish discovery, the indigenous in Venezuela were mainly agriculturists and hunters living in groups along the coast, the Andean mountain range, and the Orinoco River. The first permanent Spanish settlement in South America—Nuevo Toledo—was established in Venezuela in 1522. Venezuela was a relatively neglected colony in the 1500s and 1600s as the Spaniards focused on extracting gold and silver from other areas of the Americas. Much of Venezuela's 19th century history was characterized by periods of political instability, dictatorial rule, and revolutionary turbulence. The first half of the 20th century was marked by periods of authoritarianism—including dictatorships from 1908–35 and from 1950-58. In addition, the Venezuelan economy shifted after the first World War from a primarily agricultural orientation to an economy centered on petroleum production and export. Venezuela's prevailing political calm came to an end in 1989, when Venezuela experienced riots in which more than 200 people were killed in Caracas. The so-called Caracazo was a response to an economic austerity program launched by then-President Carlos Andres Perez. Three years later, in February 1992, a group of army lieutenant colonels led by future President Hugo Chavez mounted an unsuccessful coup attempt, claiming that the events of 1989 showed that the political system no longer served the interests of the people. A second, equally unsuccessful coup attempt by other officers followed in November 1992. A year later, Congress impeached Perez on corruption charges. Current President Hugo Chavez was elected in 1998 on a platform that called for the creation of a National Constituent Assembly in order to write a new constitution for Venezuela. Chavez's argument that the existing political system had become isolated from the people won broad acceptance, particularly among Venezuela's poorest classes, who had seen a significant decline in their living standards over the previous decade and a half. The National Constituent Assembly (ANC), consisting of 131 elected individuals, convened in August 1999 to begin rewriting the Constitution. In free elections, voters gave all but six seats to persons associated with the Chavez movement. Venezuelans approved the ANC's draft in a national referendum on December 15, 1999. In July 2000, following a long and controversial process, voters re-elected President Hugo Chavez of the Fifth Republic Movement (MVR) in generally free and fair national and local elections. The MVR and pro-Chavez Movimiento a Socialismo (MAS) party won 92 seats in the 165-member legislature. Subsequent party splits reduced the pro-Chavez members to 84 seats. In April 2002, the country experienced a temporary alteration of constitutional order. When an estimated 400,000 to 600,000 persons participated in a march in downtown Caracas to demand President Chavez' resignation, gunfire broke out, resulting in as many as 18 deaths and more than 100 injuries on both sides. Military officers took President Chavez into custody, and business leader Pedro Carmona swore himself in as interim President. On April 14, military troops loyal to Chavez returned him to power. A national reconciliation process, with participation by the Organization of American States, the UN Development Program, and the Carter Center, was unsuccessful in stopping further conflict. Opposition leaders called a national work stoppage on December 2, 2002. Strikers protested the government and called for the resignation of President Chavez. The oil sector joined other sectors of the economy and effectively shut down all economic activity for a month. The OAS Permanent Council passed Resolution 833 on December 16, 2002, calling for a "constitutional, democratic, peaceful, and electoral solution" to the crisis in Venezuela. The strike formally ended in February 2003 as political opponents of Chavez sought a recall referendum to revoke the mandate of the president. In September 2003, after an impasse in the National Assembly, the Supreme Court named a new board of directors for the National Electoral Council (CNE). After months of intense deliberations that included two conflicting signature drives overseen by the CNE, political riots over the government's disqualification of questionable signatures, and the intervention of international electoral observers, the CNE certified the opposition's results and set the date of the recall referendum for August 15, 2004. According to the CNE, President Chavez won 59% of the vote. His opponents immediately contested that the results of the referendum were marked by electoral fraud. However, international electoral observation missions carried out by the Organization of American States and the Carter Center found no indication of systemic fraud. In the wake of the referendum victory, Pro-Chávez candidates continued to sweep other electoral contests. Chávez supporters won 20 out of the total 22 state governor positions up for election in October 2004 (there are currently two opposition governors). Chavez supporters also won a majority of the seats in the August 2005 municipal council (parroquias) elections. Pro-Chávez parties won all 167 seats in the December 2005 National Assembly elections, after most opposition candidates withdrew one week before the elections over voter secrecy concerns. The final reports of the EU and OAS observer missions to the 2005 legislative elections, which were marked by record-high abstention, noted high levels of distrust in electoral institutions. The reports made specific recommendations to increase transparency and help voters regain the confidence necessary for participation. Most of the recommendations were not implemented. As a signatory of the Inter-American Democratic Charter, Venezuela has an obligation to hold "periodic, free, and fair elections based on secret balloting and universal suffrage." President Chávez was re-elected by an overwhelming majority (63%) in the December 3, 2006, presidential elections. He defeated Zulia Governor Manuel Rosales, whose Un Nuevo Tiempo (UNT) party formed an alliance with several key opposition parties. Though international observers found no evidence of fraud on election day, they did note concerns over abuse of government resources used to support the Chávez campaign, voter intimidation tactics, and manipulation of the electoral registry. In January 2007, President Chávez named a new Vice President (the former head of the CNE) and cabinet, drawing largely from deputies of the National Assembly. Chávez announced a renewed effort to implement his vision of "21st Century Socialism" in Venezuela. He asked the National Assembly to grant him special constitutional powers via an "enabling law" to rule by decree over a broad range of society and subsequently received those powers for a term of 18 months. He also took major steps to nationalize the telecommunications and electricity sectors, as well as to finalize a majority government share in many oil projects, all sectors with significant foreign investments. On August 15, President Chávez proposed a package of 33 articles to reform the 1999 Constitution. On 11 September the National Assembly enlarged a number of amendments with other 36 articles, increasing in 69 the number of articles to be voted in the referendum. Finally, the National Assembly passed the reform on 2 November. The presidential term will be increased from six to seven years. Five types of property are proposed: public, social, collective, mixed, and private property. The Venezuelan State is to govern four of these new five types of property, as it intends to play a role as owner, partner, and financier. Creation of federal territories ruled by vice presidents. The heads of federal territories will be appointed by the President of Venezuela. Autonomy of the central bank will be concluded. The international reserves will be managed by the president. Reduction of the maximum working week from 44 to 36 hours. Reduction of voting age from 18 to 16 years. Benefits of social security will be expanded to workers of the informal economy. The constitutional reform was rejected by the opposition to considered it as an attempt of President Chávez to rule the country indefinitely and to create a socialist economy. Marches against the reform were done in many parts of Venezuela. A major role in the protests was played by university students. Some supporters of Mr. Chávez such as the allied party PODEMOS, Raúl Baduel (his ex- Defense Minister) and Marisabel Rodríguez (his ex-wife) rejected the reform and called the electors to vote against the reform. On 2 December 50% of electors voted against the constitutional reform while 49% of electors voted in favor. The reform was rejected in seven important Venezuelan states, based on the number of voters, namely Zulia, Miranda, Carabobo, Lara, Anzoátegui, and the Capital District (Caracas). It is the first time since Chávez won power in 1998 that the current government lost at the polls. Abstention, which was more than 44%, is considered an important factor of the government defeat. It is thought many supporters of Chávez refrained from voting because they were not in agreement with the reform. President Chávez recognized the results, but he announced to the nation that another referendum to modify the constitution will be proposed again in the future. The previous statement was said by the Venezuelan president again on December 5. The National Assembly decided to join the presidential efforts to keep the proposal alive. By 2017, Venezuela was in serious economic and political chaos, having become a virtual military state and becoming a humanitarian disaster. Massive hyperinflation was present in the country. Many non-Venezuelan liberals had praised the nation's slide into this poor state. However, many of the "opposition" did not want to truly end the socialist policies. Venezuela's May 2018 presidential election was derided by many countries as a sham and an illustration of its descent into authoritarianism. In August 2018, the government announced it would deal with its hyperinflation simply by dropping zeros off its currency. In 2018, 40% of all Venezuelan businesses closed after Maduro imposed a massive minimum wage increase. Long lines existed for everything, even to get a passport to leave the country. The country saw nationwide power outages. Several Venezuelans warned the United States not to adopt socialism. Venezuela's government continued to receive support from Russia and China. Maduro won re-election in 2018, despite banning major opposition parties from participating in the election and despite record low turnout and serious voter fraud allegations. He started his second term despite the fact that about 60 countries did not recognize the election results. Venezuela's parliament, now controlled by the opposition, attempted to remove Maduro from office. On January 23, 2019, opposition leader Juan Guaidó, a socialist, declared himself Venezuela's interim president and was recognized by several countries. Many experts and technicians fled the country. During electrical blackouts in 2019, which the government was incapable of restoring due to a lack of skilled personnel, Social Justice Warriors began looting shops, stores, and malls. Despite Venezuela's guarantee of healthcare as a right, people contracted E. coli bacteria from contaminated water with no technicians to treat the water and a lack of medical personnel to treat the victims. Andrés Bello (1781–1865); poet, grammarian, teacher, and vice-chancellor of the University of Chile. Simón Bolívar (1783–1830); military hero and politician. Liberator of Venezuela, Colombia, Ecuador, Peru, and Bolivia. Francisco de Miranda (1750–1816); military hero, politician, and creator of the Venezuelan flag. Antonio José de Sucre (1795–1830); military hero and president of Bolivia. El Universal English language site of the conservative Venezuelan newspaper. News-The Daily Journal Site of the English written newspaper. Venezuela - Useful links University of Texas at Austin. Information about Venezuela in the BBC Country Profile. Information about Venezuela in the CIA World Factbook. Lott, Maxim (January 25, 2019). How socialism turned Venezuela from the wealthiest country in South America into an economic basket case. Fox News. Retrieved January 26, 2019. In Venezuela, socialism has succeeded the way it always does. Washington Examiner. January 26, 2019. Retrieved January 26, 2019. ↑ A New Reality for Venezuela's Indigenous Peoples. ↑ Venezuelan Opposition Leader Demands Hugo Chavez Free Jailed Protesters, Associated Press, May 30, 2007. ↑ Report on Global Anti-Semitism U. S. Department of State, Bureau of Democracy, Human Rights, and Labor, January 5, 2005. ↑ Because Freedom Matters, By U.S. Rep. Connie Mack IV and Blanquita Cullm, Naples Daily News, July 7, 2007. ↑ Venezuela assembly passes reforms, BBC News, November 2, 2007. Retrieved on December 13, 2007. ↑ Venezuelan state to govern four types of property, El Universal, October 1, 2007. Retrieved on December 13, 2007. ↑ Challenging Chávez-for-life, A new kind of opposition, The Economist, November 15, 2007. Retrieved on December 13, 2007. ↑ Former Defense Minister rejects constitutional reform, El Universal, November 5, 2007. Retrieved on December 13, 2007. ↑ Ex-wife damns Hugo Chavez ‘coup’, The Sunday Times, December 2, 2007. Retrieved on December 13, 2007. ↑ Venezuelans said “no” to Chávez’s planned reform, El Universal, December 3, 2007. Retrieved on December 13, 2007. ↑ States of Zulia, Miranda and Táchira played a decisive role, El Universal, December 4, 2007. Retrieved on December 13, 2007. ↑ Why Venezuelans Turned on Chavez, By Gould, Jens Erik, Time, December 3, 2007. Retrieved on December 13, 2007. ↑ Chávez launches second offensive to pass reform to the Constitution, El Universal, December 6, 2007. Retrieved on December 13, 2007. ↑ Parliament insists on advancing Chávez’s defeated reform, El Universal, December 5, 2007. Retrieved on December 13, 2007. ↑ Kew, Ben (December 24, 2017). Venezuela 2017: Socialist Policies Take Humanitarian Toll as Country Enters Dictatorship. Breitbart News. Retrieved December 24, 2017. Carafano, James Jay (January 11, 2019). America's progressives are so busy extolling virtues of socialism that they want you to ignore THIS. Fox News. Retrieved January 13, 2019. Adelmann, Bob (April 1, 2019). Socialist Misery Deepens in Formerly Prosperous Venezuela. The New American. Retrieved April 2, 2019. ↑ Adelmann, Bob (April 17, 2018). Starvation, Suicides Increasing Under Venezuela's Hyperinflation. The New American. Retrieved April 20, 2018. ↑ Martel, Frances (May 17, 2017). Former U.N. Security Council Head: In Venezuela, Even Opposition Uncomfortable Defying ‘Socialism’. Breitbart News. Retrieved May 18, 2017. Llorente, Elizabeth (May 21, 2018). Re-election of Venezuelan president denounced as sham, calls grow for more sanctions. Fox News. Retrieved May 21, 2018. Ulmer, Alexandra; Rampton, Roberta (May 20, 2018). Re-elected, Venezuela's Maduro faces global criticism, U.S. sanctions. Reuters. Retrieved May 21, 2018. Casey, Nicholas; Davis, Julia Hirschfeld (May 21, 2018). As Trump Adds Sanctions on Venezuela, Its Neighbors Reject Election Result. The New York Times. Retrieved May 22, 2018. Adelmann, Bob (May 21, 2018). Fraudulent Election in Venezuela Guarantees More Suffering. The New American. Retrieved May 21, 2018. See also: Mass, Warren (May 23, 2018). After Maduro’s Reelection in Venezuela, Chaos Worsens and Exodus Increases. The New American. Retrieved May 23, 2018. ↑ Vyas, Kyle; Castro, Maolis (August 18, 2018). Venezuela Devalues Currency and Hikes Wages, Stoking Fears About Instability. The Wall Street Journal. Retrieved August 18, 2018. ↑ Tennant, Michael (August 17, 2018). Venezuela’s Hyperinflation Solution? Drop Zeros From the Currency. The New American. Retrieved August 18, 2018. ↑ Xenakis, John J. (August 19, 2018). World View: Socialist Venezuela Introduces Fantasy Currency and Socialist Changes. Breitbart News. Retrieved August 19, 2018. ↑ Tennant, Michael (August 21, 2018). Venezuela Takes More Desperate but Futile Steps to Save Socialism. The New American. Retrieved August 21, 2018. ↑ Mass, Warren (September 17, 2018). Thanks, Maduro: Nearly 40% of Venezuelan Businesses Closed. The New American. Retrieved September 17, 2018. ↑ Tennant, Michael (October 9, 2018). In Venezuela, You Even Have to Wait in Line to Leave. The New American. Retrieved October 10, 2018. ↑ Adelmann, Bob (March 11, 2019). Nationwide Power Outages Sending Venezuela Back to the Dark Ages. The New American. Retrieved March 11, 2019. ↑ Kan, Janita (February 6, 2019). Venezuelans Warn Against Bringing Socialism to the United States. The Epoch Times. Retrieved February 7, 2019. ↑ Adelmann, Bob (October 29, 2018). China, Russia Rushing to Keep Venezuela Alive as Crisis Deepens. The New American. Retrieved October 29, 2018. ↑ Kew, Ben (December 11, 2017). Venezuela’s Maduro Bans Opposition Parties from 2018 Election. Breitbart News. Retrieved January 13, 2019. ↑ Martel, Frances (May 21, 2018). Venezuela: Maduro ‘Reelected’ with Record Low Turnout, Rampant Fraud. Breitbart News. Retrieved January 13, 2019. Adelmann, Bob (January 10, 2019). Venezuela’s Marxist President Maduro Inaugurated for Second Term. The New American. Retrieved January 13, 2019. Suarez Sang, Lucia I. (January 10, 2019). Venezuela’s Maduro starts second term despite worsening economic crisis, growing international isolation. Breitbart News. Retrieved January 13, 2019. Kew, Ben (January 10, 2019). Venezuela’s Maduro Inaugurated for Second Term: ‘We Are in a World War’. Breitbart News. Retrieved January 13, 2019. Adelmann, Bob (January 15, 2019). Pressure Building to Remove Venezuela’s Marxist Dictator. The New American. Retrieved January 15, 2019. ↑ Mass, Warren (January 14, 2019). Venezuela Legislature Wants Maduro Out; Brazil Recognizes Guaido as President. The New American. Retrieved January 14, 2019. ↑ Newman, Alex (February 7, 2019). Venezuela: Replacing Brutal Socialist With More Socialism? The New American. Retrieved February 7, 2019. ↑ Martel, Frances (January 23, 2019). Venezuela Swears In Opposition Leader as President. Breitbart News. Retrieved January 26, 2019. Martel, Frances (January 26, 2019). Maduro Regime, American Left Ignore Socialist Pedigree of Venezuela’s New President. Breitbart News. Retrieved January 26, 2019. This page was last modified on 9 April 2019, at 19:00. This page has been accessed 50,290 times.